The summer weeks in Nijmegen have resulted in the first version of an ultra-distance running route through the beautiful surroundings of my home town. I outlined my ambitions for such a route in earlier posts, and version 1.0 is in line with most of my pre-recce imaginations: the overall lay-out, the length, and principles of including (1) maximum diversity of landscapes and sites-of-interest, (2) maximum off-road paths and trails, and (3) minimum need for description so as enable running the route based on studying a map in combination with descriptions than can be taken in without disturbing a run too much. Close the trip stats window to get a more uncluttered view; the top right corner has buttons to change the imagery (google terrain, map, satellite) and the zoom function allows closer inspection of details. An implicit principle – probably considered it a naturally given, but comments from companion route explorers made evident it isn’t – became explicit during the reccies: including (4) maximum altitude meters (don’t get all excited – it’s still the Netherlands). 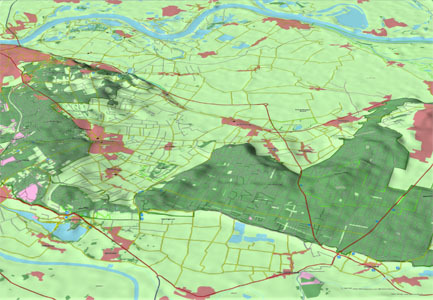 I learned that the current route leaves out two ecologically distinct areas, the Overasseltse and Hatertse vennen and the Bruuk. The Bruuk could be included without too much trouble by attaching a detour to the current Reichswald section, the vennen (fens) would require a substantial detour, either right at the start, or right at the end, would increase the route length considerably (compromising the original concept from something that is doable for your average ultra-enthusiast during mid-summer day-light hours, but, as an optional extension, would be of interest to those looking for something getting closer to the 100 miles distance), and needs recceing to figure out a route that to the extent possible avoids trafficked roads. Another extension possibility is the city. An earlier post about the Salomon city trail depicts one possibility, but one could beyond that and include town further to the West, which makes for running over more Roman era ground, some interesting industrial area townscape that is currently being gentrified in exciting ways, as well as take in Nijmegen’s two newest bridges and a bit of the prize-winning infrastructure project that is going to change the city’s riverfront dramatically. A more substantial extension, and certainly a lot more surfaced underground but adding lots of historic interest (Roman times, Charlemagne, and more). The Batavians lived in the Netherlands at the start of the Christian era and in 69 A.D. they famously revolted against the Romans, who ruled northern Europe. In the early 17th century the Dutch liked to compare themselves to these ‘forefathers’, casting their own struggle for freedom from Spain in the light of the Batavian revolt against Rome. It was in this vein that the city rulers chose to decorate the new Amsterdam Town Hall, an awe-inspiring symbol of their newly acquired independence, with this series. 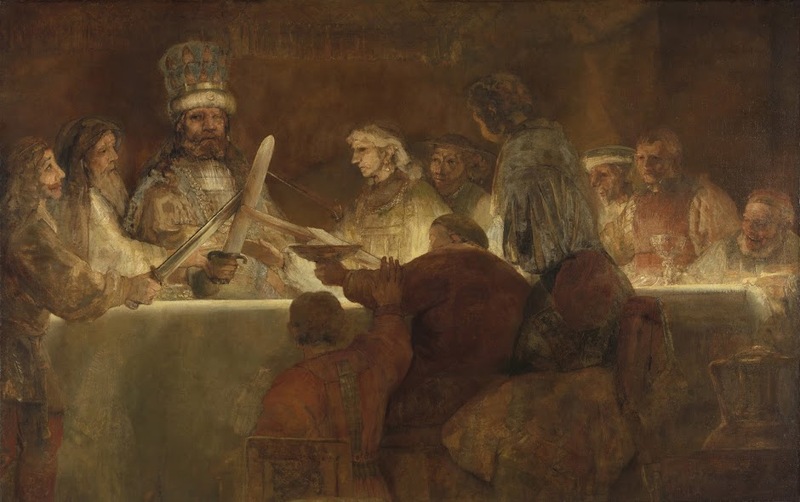 The painting depicts the moment when, at a meal in a sacred grove, the Batavian leader Claudius Civilis addresses other chieftains and brave warriors and calls on them to swear an oath against the Romans. In other words the beginning of the rebellion. The above mentioned sacred grove? The Ketelwald (Reichswald), more than half of the route traverses this grove! Why all this attention to history when working on a (trail)running route? The Nijmegen environs may be way less overwhelming than Mustang, my previous ‘project’, but that makes the mind only more important for turning a run into a Run. Or better put: it makes the mind differently important. Being prepared meant having a fighting chance of not getting lost in Shangrila fantasies in the case of Mustang, for Nijmegen it means having a fighting chance of seeing the real wonders behind the agreeable parkscape one travels through.. This entry was posted in (trail) running, un nimweegs rondje and tagged Batavians, Ketelwald, Nijmegen. Bookmark the permalink. Je kunt ook niet stil blijven zitten Roger.